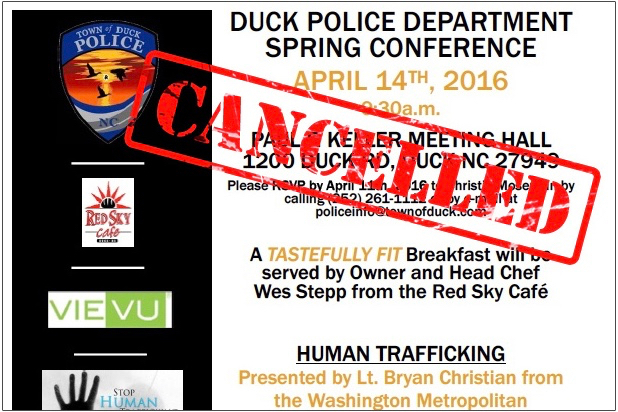 While not nearly as significant as PayPal’s decision to scrap an expansion into North Carolina in response to state House Bill 2, a conference scheduled by the Duck Police Department has been cancelled because of the controversial legislation. The April conference was to kick off with a breakfast, followed by a talk on syringe exchanges, a trip to the Gun Shack’s new indoor shooting range and a few other topics. But the heart of the day-long event was to be two keynote speakers from the Washington, D.C. police department. 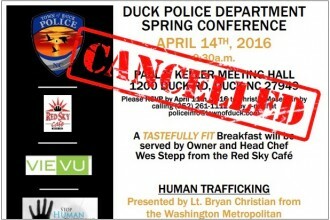 D.C. Metro Police Lt. Bryan Christian was scheduled to speak on human trafficking. Depending on the source, North Carolina typically lands in the top -10 “most likely” states where human trafficking occurs. Following Christian, D.C. police chief Cathy L. Lanier was scheduled to give a presentation on body-worn cameras. 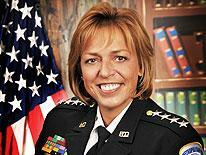 Washington, D.C. Metro Police Chief Cathy Lanier was scheduled to speak. But in the wake of the North Carolina General Assembly’s passage of HB2, private sector companies and governments, both state and local, have begun to initiate travel bans and even withdraw plans to expand business into North Carolina. PayPal axed a $3.6 million global operations center slated to be constructed in Charlotte in the aftermath of HB2, which not only overturned a Charlotte ordinance concerning transgender use of public restrooms and other gender-specific facilities, but also outlawed local and county governments from passing ordinances protecting LGBT people from discrimination in housing, employment, customer service and other areas. In the case of Washington, D.C., Mayor Muriel Bowser issued a ban on “non-essential employee travel” to North Carolina in the aftermath of HB2’s passage. That travel ban applied to both Christian and Lanier, resulting in the cancellation of the conference.